Every holiday I try to bake something unique, something memorable. This year I am putting a twist on the Gâteau Basque. 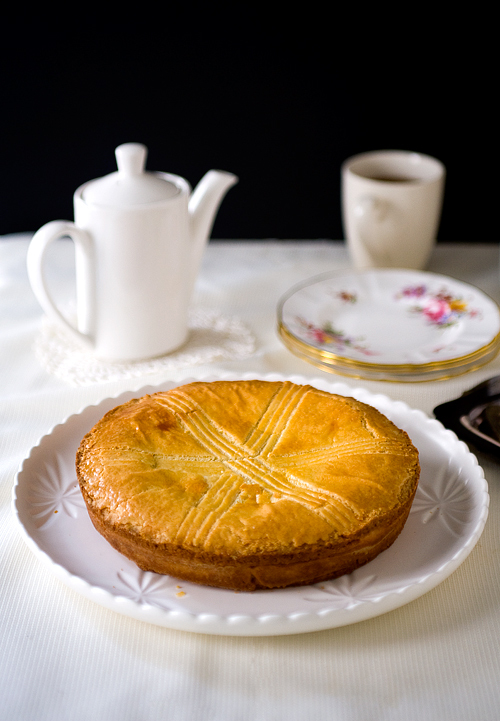 Gâteau Basque originated in the Basque region of France. It is traditionally made with an almond cookie dough, filled with pastry cream and/or cherry preserves. I first tasted it when I was at my baking school, a cross section revealed its cookie and cream layers. Curious, I took a piece. Then I had a moment of confusion as I ate it – should I define this as a cake or cookie? It was deliciously crumbly, nutty, creamy, and rich all at the same time. I finally learned of the name when I asked my instructor. It is not a very popular treat in North America, but in my opinion, it deserves way more attention. 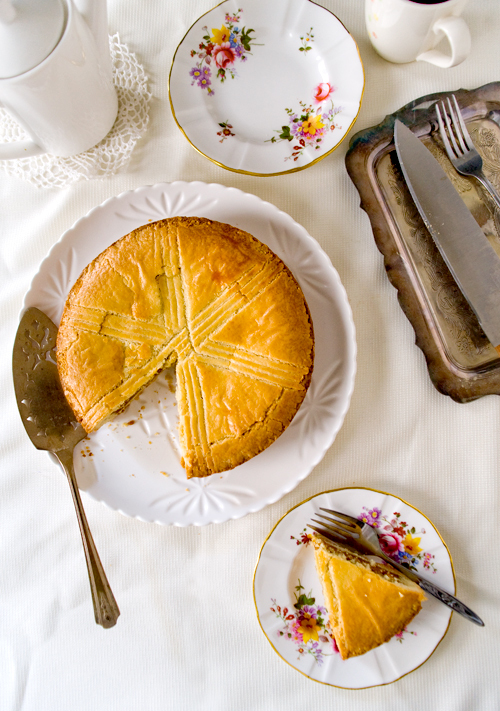 This Salted Caramel Gâteau Basque was inspired by the vanilla salt at the bakery I work at. Since the dessert is quite rich, adding salt and caramel would cut back its richness, and add another layer of flavour. I think this dessert would be perfect to end a holiday dinner, it is not very difficult to make, yet I am certain you and your guests will be delighted at its texture and flavour! Serving Size: One 8 inch round cake, about 2 inches high. In a small bowl, whisk together egg yolks, 2 tbsp of milk, and cornstarch until mixture is all smooth and pale in colour. Combine milk and whipping cream in a microwave safe container on high power for about 2 minutes. Set aside. In a medium heavy bottom saucepan, heat sugar and vanilla seeds on medium high heat to make a dry caramel. Try not to stir the sugar, swirl the pan occasionally until the sugar turns into an amber colour. Slowly pour into hot milk/cream mixture, stir the bottom of the pan to ensure the caramel is cooked into the milk. Take out vanilla pod. Temper egg yolks but slowly adding small amounts of hot milk. Return mixture into pan, heat on medium heat, keep whisking until mixture boils, or when bubbles break the surface. If the pastry cream is lumpy you can strain it before storing it. Transfer pastry cream into a clean container, place a piece of plastic wrap directly on top to prevent a skin from forming. Chill until ready to use. In a medium mixing bowl, cream together butter, sugar, and almond flour with a wooden spoon or silicone spatula until light and pale in colour. Incorporate eggs and vanilla extract, mixing until it is homogenous. Lastly fold in flour and salt, mixing until a dough forms. Don't overmix. Shape dough into a log, wrap with plastic and chill for at least 2 hours before using. Preheat oven to 350 F / 175 C.
Take out dough to room temperature to warm up for about 15 minutes before rolling. Knead dough a couple of times to soften. Take half of the dough, dust lightly with flour, and roll into a 10 inch round. Trace and cut out the dough to the size of the bottom of you cake pan. Roll remaining dough into a 1/2 inch diameter rope. Brush the edge of the bottom piece of dough lightly with water. Line the edge with the dough rope and press gently into the bottom. Fill the center with the pastry cream. You can pipe it in, or just scoop it in with a spoon. Make sure the pastry cream is level before sealing it with the top pastry. Lightly dust the second half of dough with flour, roll it into a 10 inch round. Trace and cut out a round the size of the top of you cake pan. The size of the top and bottom rounds will be different if you are using a tapered cake pan. Brush the edges lightly again with water, carefully place the top round onto the cake, and seal by gently pressing the edges with your fingers. 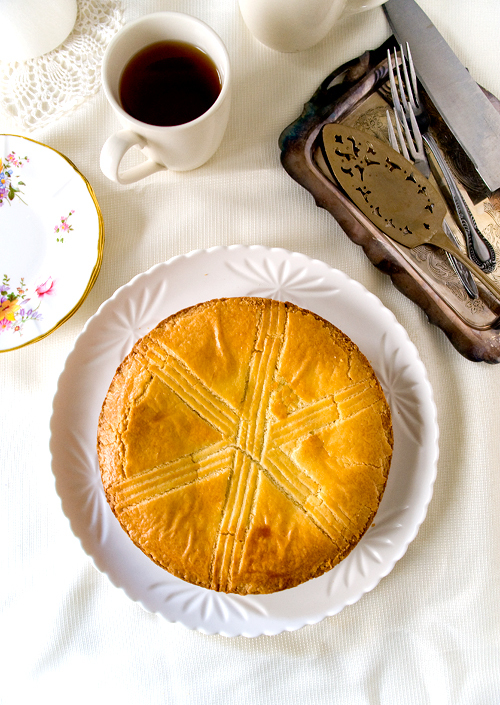 For the finishing touch, brush the whole top with egg wash, using the tines of a fork, lightly score the signature gâteau Basque pattern. Bake in preheated oven for 30-40 minutes, until the top is golden. Cool completely before removing from the pan! Serve at room temperature. Though it is easier to bake this in a cake ring, but it is perfectly fine to use a cake pan as well, it just requires a steady hand when taking it out. I received a lovely Baker’s Secret Easy Store baking set and a holiday red coloured 8″ round cake pan from World Kitchen. What is more festive than serving a cake in a red pan? The Easy Store set is such a clever design, it has 5 pieces of bakeware that fits into a small space-saving package. I own many pans from Baker’s Secret, they provide a great variety of sizes and selection of pans for home bakers. If you are looking to bake something different and impressive this holiday, I highly encourage you to try this French treat! It has a crunchy exterior, dense and cake-y towards the center with a salty and sweet creamy filling. It is almost all you can ask for in a dessert! You can prepare the dough and the cream filling a day or two ahead, assemble and bake on the big day. It is best served at room temperature, on the day that it is baked. Any leftovers should be refrigerated. You can also refresh it in a 350 F / 175 C oven for 2-3 minutes if you want it warm with a big scoop of vanilla ice-cream – so divine! Believe it or not, this simple recipe took me three tries to get it right, I tried using a gooey caramel with vanilla pastry cream, a cream that was too sweet etc. I even dropped the whole cake once because the pan slipped, so be very careful when you revert your cake! Thanks to World Kitchen, I am hosting a giveaway of a Baker’s Secret 8 inch square pan, just in time for some holiday baking! Join us at the Baker’s Secret Twitter Party on Wednesday, December 9th! There will be recipes, prizing, and fun, visit here for more details! [UPDATE: Dec 7th – Congratulations to Jonnie from Alberta who was chosen randomly as the winner of this giveaway. Thank you for those who participated, hope I look forward to hosting again!] This giveaway is open from Sunday, November 30th, 2015 until Sunday, December 7th, 2015 at 12:00AM PST and is only open to (including Quebec). The winner will be chosen randomly via rafflcopter. You will be notified through email – please respond within 48 hours! You will need to provide a street address (not a P.O. Box) and a phone number so we can send you the prize directly. Disclaimer: this post is sponsored by World Kitchen. They have compensated me with Baker’s Secret bakeware and monetarily. All opinions are my own. I love baking cheesecake during the holidays. Every year I try to make a new one that goes with the theme, gingerbread cheesecake, candy cane cheesecake, etc. Woo I am a cheesecake fan! I like baking shortbread cookies during the holidays. Shortbread is a must for my holiday baking too! I love making homemade chocolate bars. I always start with peanut butter balls and hershey kisses cookies, and assorted bark. Gotta love the classic holiday treats!